The horse healthy immune system which is designed to protect the equine from invading pathogens is extremely complex. When everything is functioning in synchrony, the system works well. If horses are malnourished this negatively impacts cell production. Even the well-fed horse can be at risk of suppression of the immune system if his diet doesn’t contain the necessary micro- and macro-minerals. Micro-minerals include such elements as zinc, copper, cobalt, selenium, and manganese, while macro-minerals include calcium, phosphorus, and magnesium. Age can have an effect at both ends of the spectrum. The very young and the very old. 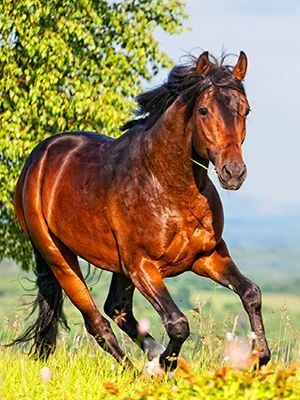 In the very young horse, the immune system is in a developmental stage, and in the old horse, its capabilities are diminished as part of the aging process. The problem is that many things can compromise the immune system, and when that happens, the horse is at an increased risk of developing a disease. Your horse’s immune system is under constant attack. There are many diseases and viruses that affect horses, eastern and western encephalomyelitis, tetanus,rhinopneumonitis , influenza, strangles, rabies, Potomac horse fever (PHF) and west nile virus are the primary concerns. Parasites can also weaken your horse’s immune system. Parasites are a natural part of life for grazing animals like horses. There are several types of intestinal worms that can infect your horse year round. And the energy spent fighting off an infestation can deplete nutrition and ultimately the immune system. Serious conditions can develop if your horse’s immune system is not properly maintained. Both viruses and bacterial infections can take their toll on your horse’s health. And the recovery process can not only be long and time-consuming, but it can also be a very expensive prospect. Building and Maintaining a Healthy Immune System Vaccinations – A healthy immune system starts with vaccinations. Most horse owners will do the standard spring shots, but as we noted above, there are many diseases and viruses that affect horses. It’s important to consider what your horse is likely to be exposed to and vaccinate accordingly. Hoof Care – Keeping your horse’s hooves clean is the best way to prevent thrush from developing. You should also have hooves trimmed by a farrier every 6-7 weeks. Parasite Control – Parasite control is very important in maintaining your horse’s health and helping prevent intestinal damage. There are several types of worms that can infect your horse. A regular worming schedule that uses the three main types of worming chemicals is key to a healthy horse and helps keep the immune system strong. Fly Control – Flies are not only a nuisance but can carry disease. Keeping flies at bay is an ongoing process with horses. There are several types of fly control products to consider including feed based, natural repellents, chemical repellents, and protective masks. Consistent Feeding – Feeding a consistent and balanced diet will help improve your horse’s overall immune system. Quality grains and hay should be used. Upsets to your horse’s digestive system can increase the chance of developing infections. Exercise – Regular exercise keeps blood flowing properly and immune systems healthy. Be sure to exercise your horse on a regular basis especially if it is stalled. And do your best to keep the stall clean. A dirty stall is inviting infection. Grooming – Good grooming stimulates blood circulation and can help you find sore spots. Early detection of sore spots can help prevent costly infections. Teeth Floating – You should schedule a time with your veterinarian to have your horse’s teeth floated. Maintaining proper teeth condition is the key to proper eating habits and nutrition. Supplements – When your goal is a healthy immune system, it’s important to consider vitamins and minerals, fatty acids, hoof nutrition, digestion, muscle support, and cardiovascular support. There are supplements available that can help you achieve your immune system goals. U.S. and Canada Pricing. For International Prices, please Contact Us. The horse immune system is designed to protect them from invading pathogens is extremely complex. If your horse’s organism functions well, then this whole system works. But, it can easily be compromised by demanding conditions. As a result, your horse can become ill and you will have to call your veterinarian to diagnose and treat it. 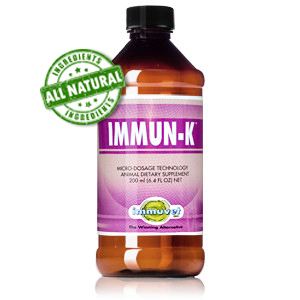 Immun-K™ is a special formulation designed to target the horse immune system. Enhance the effectiveness of the immune system’s ability to defend challenges from viral and bacterial infections. Decrease the effects of exposure to environmental allergens. As an adjuvant to anti-bacterial and anti-viral therapy. Reestablish appetite and levels of feed intake. Reduce the stress created while traveling (Shipping Fever). © Copyright 2018 Immuvet All Rights Reserved.